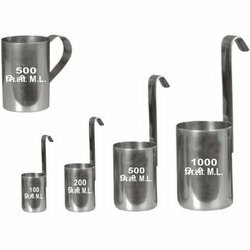 The Stainless Steel liquid measure set are very capable to weigh and measure the volume of milk and help to resolve confusions that may crop up at a later stage. Our Measuring Sets are fabricated using AISI 304 grade stainless steel. We offer our liquid measure set in customized form as per clients’ specified requirements. These are available in both round and long handle types. We are known as one of leading manufacturers of Stainless Steel Milk Measurements, which are manufactured in complete compliance with international quality standards. Known for their features portable and weather resistant, durability, these are widely used to weigh and measure the volume of milk. These also play an active role in resolving confusions that may crop up at a later stage. Furthermore, we provide these Stainless Steel Milk Measurements to clients at affordable rates.